Barrie Kosky’s Saul, the centrepiece of the 2017 Adelaide Festival, is a glorious, never literal evocation of the spirit and look of 18th century opera, featuring dazzling costuming, joyous dancing, striking tableaux vivants, foot-lighting and a field of fluttering candles in a sumptuous staging that radically darkens as the opera’s paranoid protagonist, Saul (Christopher Purves), King of the Israelites, fearing David (Christopher Lowrey), the slayer of the giant Goliath, will supplant him, orders his son Jonathan (Adrian Strooper) to kill the very man he is deeply attracted to, as is his sister Michal (Taryn Fiebig). Kosky has transformed Handel’s great oratorio into a superb opera in which life is writ large, but nuanced at every moment of the work’s vibrant unfolding, from triumphant celebration to emergent love, escalating madness, the deaths of Saul and Jonathan, intense grieving and new national resolve with David as king, Michal his queen. 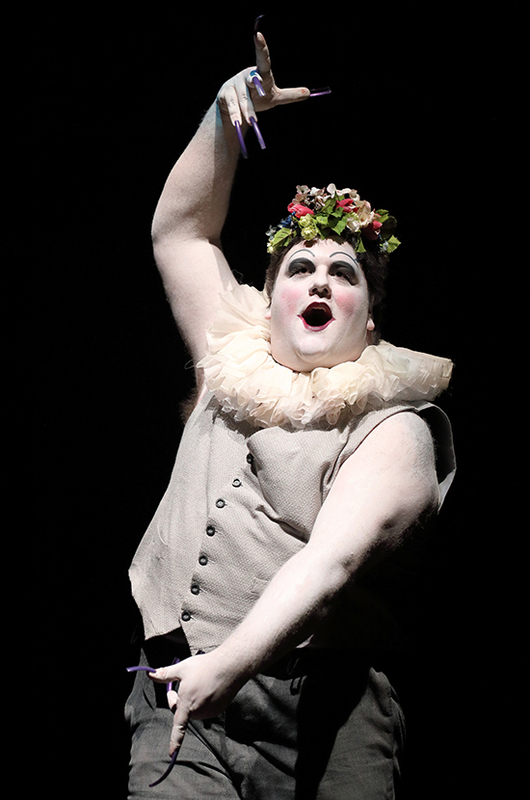 Some reviewers admiringly imagine that Kosky has built his own substantial edifice on the seemingly slight foundations of Charles Jennens’ spare libretto, but in interviews the director himself has paid homage to its lucid, inherent dramaturgy, superior to those, he thinks, of Handel’s operas. Kosky’s ingenious dramatic realisation of the oratorio is faithfully rooted in and flowers from libretto and score. His masterstroke, without disturbing the original’s shape, has been to expand and intensify the stage presence of Saul (his songs are relatively few; see the Glyndebourne Festival Saul DVD interview with singer Christopher Purves about his being convinced by Kosky to take on the role), granting the performer an entirely believable emotional and physical trajectory (petty jealousy, frantic pacing, violent fury, alternating madness and lucidity, a fit and hallucinations, most enacted within the framework of others’ songs) and giving full weight to the impact of his jealousy and madness on his family and nation—already so strongly felt in the music. Purves’ performance, intensely physical, is a miracle of concentrated anger, helpless insanity, self-hate and admitted cowardice. Kosky also transforms the oratorio’s chorus from choir into a forceful stage presence—a curious and energetic participator, mourner and moral observer—while wide-smiling, robust and agile Stuart Jackson merges multiple small roles into a cabaret-like shapeshifter, leading the chorus, commenting or grabbing our attention to take the action in another direction. Yes, Kosky’s inventiveness is prodigious but it’s well-founded and organic, evident in the smallest touches, like David’s refusal of praise abruptly interrupting Saul’s invitation to join his court with the sustained opening note of the piercingly beautiful “O King, Your Favours.” It adds potential fuel to the fire of Saul’s envy, first witnessed when he picks up David’s sling and savagely jams the handle into the eye of the slain Goliath, as if to proclaim his part in the victory; but his court, so taken with David, takes no notice. After deflecting Saul’s praise, the physically reticent David suddenly takes Saul’s head in his hands and plants a kiss on the bewildered king’s brow. The few kisses in the opera stand out like motifs: the violent one forced on his older daughter Merab by Saul in a fit of rage; the kiss between David and Jonathan, a declaration of their love for each other; and the kiss given Saul by the Witch of Endor (Kanen Breen) so that the king can be possessed by the spirit of the prophet Samuel in order to predict his fate. Touch, in this courtly world, is rare, but compelling when it happens. 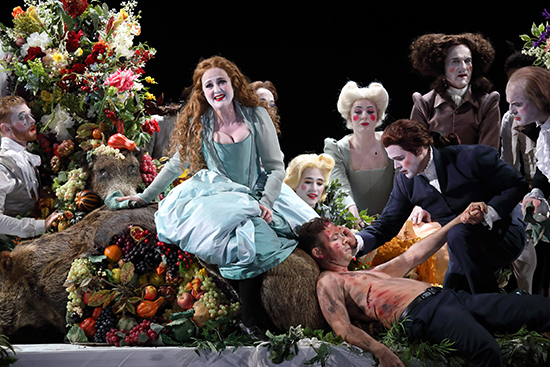 In the opening revelry, the royal family and the chorus are compulsively drawn to the dazed David, coursing about him, hoisting him onto the banquet table that dominates the stage and resting him against a wild boar amid other fare, flowers and the king’s subjects. Saul, Michal, Jonathan and Merab tenderly wash the sleeping David, an image of familial intimacy that will soon dissolve. Once recovered David becomes the target of Michal and Jonathan’s desire, admiring him in song for his courage and piety and repeatedly approaching and withdrawing until David acts, drawing both to him, arms about them (while Saul silently admonishes Merab for her rejection of marriage to the low-caste David promised by Saul). After Saul collapses in an agonising fit—Jonathan, Merab and Michal holding him down—it is not simply David’s sublimely consoling song (“O Lord whose mercies numberless”) that revives the king, but the young man’s taking the king into his arms, cradling and rocking him. Saul slowly raises a hand, reaching tenderly for David’s cheek in a brief respite from his madness. We hear, not see, the hero’s harp played; Kosky opts for touch with David’s simple, caring act which palpably brings home the shared concern of the family for Saul and their understanding of his condition which they express in heartfelt song. In the second part of the opera, when Saul feels abandoned by his family (Jonathan berates and strips him) and God, he turns like Macbeth (with whom he shares self-loathing) to the underworld, calling up the Witch of Endor who rises from the earth between his thighs—as if the king is giving birth to a monster—and breastfeeds him, preluding the kiss that will unleash the spirit of Samuel. The dark embrace between king and witch signals a corruption of the intimacy David has brought to Saul’s family. 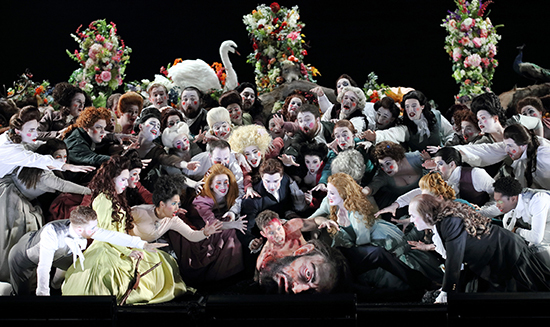 Towards the end of the opera’s immersive 11-minute overture, an indistinct shape emerges slowly out of the dark: a huge bloodied head resting on its side. Suddenly, we are dazzled by a brilliantly lit stage-wide banquet table with a white cloth and dressed with ravishing floral arrangements, a swan, a fish, a giant clam and, at its centre, the body of a wild boar. Amid these, on the table, the Chorus of Israelites, richly attired in astonishing materials, colours, heightened makeup and wigs, celebrate with song and highly articulated gesturing, victory over the Philistines that came with David’s defeat of Goliath whose head lies before them. From their number spring six dancers whose expressiveness amplifies the already evident joy. The highly contrastive floor is a gently upward sloping field of black, fine-grained coal-like soil through which the whole cast wade, barely impeded but nonetheless feeling the weight of the earth, so potent in the work’s second part. 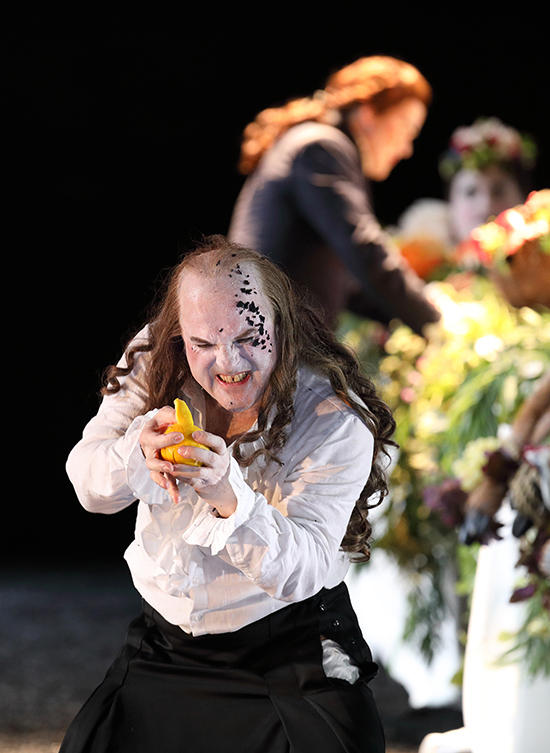 Kosky, set and costume designer Katrin Lea Tag and lighting designer Joachim Klein deploy the banquet table from three perspectives in the first part of the opera before focusing solely, in the second part, on the soil, a field full of surprises and of horrors. If the work’s first major scene, in which Saul’s envy of David grows, is marked by stage width and grandiosity, in the second, in which Saul first goes mad and is consoled by David’s singing, it is depth of field (and deep-felt passions), established by breaking the table in two—still dressed for the banquet—so that its parts run parallel upstage with a wide, open space that gives full focus to Saul’s rants and sudden collapse. The third setting is quite abstract, the two parts of the softly glowing table positioned parallel across the stage with a a narrow gap from which emerges the head of a mad Saul, shorn of his long locks and with a host of hands surreally scampering about him and over his skull. It’s here too that David and Jonathan first kiss in uncluttered space and a recovered and seemingly repentant Saul offers Michal (who jumps for joy) to David to be his wife. It’s as if all the superfluities of the world have been stripped away, drawing us more palpably into intractable worlds of love and madness. Throughout the opera’s second part we have a single view of the hill of soil, benign at first, when out of it rises a rotating organ played by be-wigged conductor Erin Helyard (a version of Handel who shocked his librettist by purchasing the very expensive instrument for the premiere), but then increasingly disturbing. Amid a field of implanted candles, Merab is raised up out of the soil, lamenting her father’s madness, acknowledging that the David she rejected for marriage “has qualities which justice bid me love” and singing the superbly affecting aria “Author of peace” in sinuous counterpoint with cello and harpsichord. The soil becomes a vast, eerily dim field, Saul racing about in circles and rolling down it before calling up the Witch of Endor. Subsequently the field is littered with the ghost-like, restless battle-dead, momentarily jerking into life, and the heads of Saul and Jonathan. Michal and David grieve over them before assuming power, joining chorus and dancers in a final dance of celebration on this soil from which life flows and wherein perhaps it ceases. Kosky’s Saul is alive with movement. 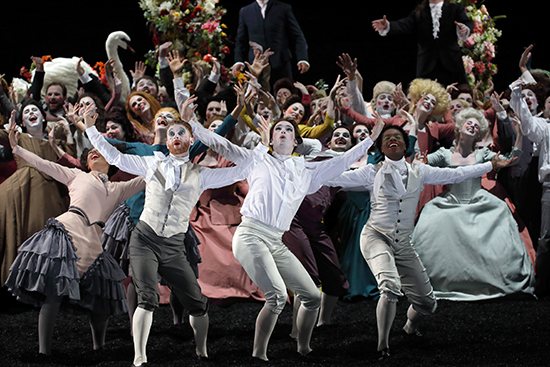 The superb State Opera chorus is highly animated, each member characterful, gesturing distinctively and drawn at times into large-scale dance. So too, at the end of part one in the celebration of the imminent marriage of David and Michal, is an apparently recovered Saul, moving calmly upstage, swaying slightly, gently swirling his skirt and then treading down through the happy throng to face us; his demeanour etched with panic, he cries, “I am the King! I am the King!” (a rare, perhaps debatable, directorial addition, as is an earlier desperate utterance, “I am not mad,” but in line with the influence of Shakespeare’s Lear, as Kosky has noted, on Handel and Jennens). Otto Pichler’s choreography for his dancers seamlessly blends elements of courtly dance, folk, even Can Can kicks and the rapid, sharply articulated movements of 18th century automata. If the dancers appear compulsive and the chorus a mass of movement (when not in tableaux) and Saul a chronic wanderer, David is a singularly still presence, save for our first sight of him, battle-dazed, bloodied, staggering about, almost assaulting Saul and perching on Goliath’s head, indifferent to the victory celebrations. Recovered, he is as if from some other sphere, calm, resolute, his voice angelic but capable of anger (he is unforgiving of the killing of Saul—a king is a king, whatever his faults), exhortation and redemptive power. Like Handel and Jennens, Kosky is taken with the oratorio’s kinship with Shakespeare’s King Lear, his direction, dramaturgy and scenography physically and visually intensifying this family drama of abused royal power threatening life, love, loyalty and the state. The love between David and Jonathan is made homosexual, sealed with a passionate kiss, giving David’s lament for his friend a contemporary weight doubtless reaching beyond Handel and Jennens’ idealised vision: “Great was the pleasure I enjoy’d in thee, / And more than woman’s love thy wondrous love to me!” Otherwise there is no disruption: David holds his queen’s hand in the final scene of a revived Israel. Nor is there comment, implicit or explicit, on Biblical Israel’s bloody territorial wars in terms of today’s incursions into Palestine. Kosky’s Saul emerges from and sustains a rich humanist tradition, just as Peter Sellars did in his seminal transformation of another Handel oratorio, Theodora, into opera for the 1996 Glyndebourne Festival (an inspiration, says Kosky). While remaining faithful to its source, Sellars’ production is an explicit condemnation of US state-sanctioned execution of criminals (Christians under Roman rule in the oratorio) in a frightening contemporary setting. Kosky doesn’t ‘update’ in that sense, rather he reimagines and vigorously heightens our sense of what 18th century opera might have looked like, making Saul a great 21st century work about then and now and for other directors and collaborators to make their own in a grand, if ever contested and mutating, humanist continuum. 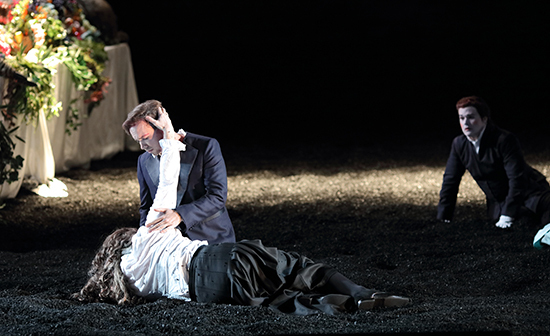 Don’t altogether lament not being able to see Saul in Adelaide; sound and image are top quality in the DVD of the Glyndebourne Festival premiere. The superb principal performers and the dancers are the same as in the Adelaide remount.